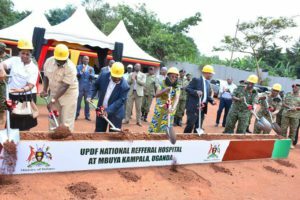 Officials at the groundbreaking ceremony for the UPDF National Refferal Hospital in Mbuya recently. Part of the army land at the barracks is being claimed by individuals. The UPDF land board has accused the Uganda Land Commission (ULC) of parcelling out land belonging to the Ministry of Defence to private individuals in different parts of the country. Appearing before the Commission of Inquiry into land matters on Friday, the chairperson of UPDF land board, Lt Gen Joram Mugume, said despite occupying 72-acre land on Plots 28 and 29 in Mbuya occupied since Independence, it is now being claimed by many individuals, including Maimuna Amin, the daughter to former President Idi Amin. Gen Mugume said the army is contesting the same land with the National Housing and Construction Company Limited. He added that ULC in 2010 leased the land on lower Mbuya on Chwa II Link, which is occupied by the army, to City Care Holdings for five years, despite protests from the Defence ministry. Gen Mugume said ULC also sub-divided plot M21 at Upper Mbuya which has been occupied by the army since 1960s, into plots which were allocated to different individuals. “We have also learnt of recent sub divisions of the same land at Upper Mbuya by the department of Surveys and Mappings where ten plots have been created. We don’t know created for who, who instructed them to sub divide, we are trying to find out through an internal board of inquiry,” he said. “We are not supposed to keep land titles. Whenever we acquire land, our duty is to pursue the acquisition of that piece by processing all the documents and finally when it is acquired and have a title, you transfer that title with its documents to Uganda land Commission (ULC) who are the custodians, for us we are users,” he said. Gen Mugume, also the senior presidential advisor on military affairs, told the probe team that the land at Kaweweta, which the army bought from East Mengo Growers Cooperative Society, has since been encroached on. He also accused the Jinja District land board of irregularly allocated land in Kimaka that houses the Senior Staff and Command College. Last week, the Chief of Defence Forces (CDF), Gen David Muhoozi, appeared before the land probe in regard to issues related to land occupied by the army and the ministry of defence. “There are many lands we occupy across the country and we also have our issues that we wanted to put across to the Commission including encroachment, our land being given to other entities without our consent, so we put all those issues to the commission,” he said. Deputy AG Rukutana kicked out of land probe, tells Justice Bamugemereire to go and hang!